Mothers against decapentaplegic homolog 1 also known as SMAD family member 1 or SMAD1 is a protein that in humans is encoded by the SMAD1 gene. SMAD1 belongs to the SMAD, a family of proteins similar to the gene products of the Drosophila gene 'mothers against decapentaplegic' (Mad) and the C. elegans gene Sma. The name is a combination of the two; and based on a tradition of such unusual naming within the gene research community. It was found that a mutation in the 'Drosophila' gene, MAD, in the mother, repressed the gene, decapentaplegic, in the embryo. Mad mutations can be placed in an allelic series based on the relative severity of the maternal effect enhancement of weak dpp alleles, thus explaining the name Mothers against dpp. SMAD proteins are signal transducers and transcriptional modulators that mediate multiple signaling pathways. This protein mediates the signals of the bone morphogenetic proteins (BMPs), which are involved in a range of biological activities including cell growth, apoptosis, morphogenesis, development and immune responses. In response to BMP ligands, this protein can be phosphorylated and activated by the BMP receptor kinase. The phosphorylated form of this protein forms a complex with SMAD4, which is important for its function in the transcription regulation. 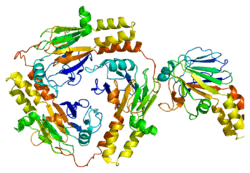 This protein is a target for SMAD-specific E3 ubiquitin ligases, such as SMURF1 and SMURF2, and undergoes ubiquitination and proteasome-mediated degradation. Alternatively spliced transcript variants encoding the same protein have been observed. SMAD1 is a receptor regulated SMAD (R-SMAD) and is activated by bone morphogenetic protein type 1 receptor kinase. ↑ Hoodless PA, Haerry T, Abdollah S, Stapleton M, O'Connor MB, Attisano L, Wrana JL (May 1996). "MADR1, a MAD-related protein that functions in BMP2 signaling pathways". Cell. 85 (4): 489–500. doi:10.1016/S0092-8674(00)81250-7. PMID 8653785. ↑ Riggins GJ, Thiagalingam S, Rozenblum E, Weinstein CL, Kern SE, Hamilton SR, Willson JK, Markowitz SD, Kinzler KW, Vogelstein B (July 1996). "Mad-related genes in the human". Nature Genetics. 13 (3): 347–9. doi:10.1038/ng0796-347. PMID 8673135. ↑ "Entrez Gene: SMAD1 SMAD family member 1".